Welcome to Chiang Mai Community Church! Welcome to Chiang Mai Community Church! Whether you’re just passing through or just moved to Chiang Mai, we’re delighted to have you here today as a part of this ‘international’ family! It won’t be long before you begin to realize that there is great diversity in this family, but also I hope you sense the underlying ties that unite us.Though our family is made up of people from many denominations, nations, cultures and languages, we regard the Word of God and our relationship with God and with one another, as the greatest sources of our identity. If you’re here for a few weeks you’ll see the variety of ways in which our worship is expressed, through praise, prayer, and preaching, but we believe it is our heart connection with God, both individually and corporately, that is at the core of our worship.In our service of one another we believe each of us has a significant role to play in the life of our local family. As each of us acknowledge our God-given gifts and abilities, we give expression to them in the variety of ways that we serve within the Church. We pray that you will be greatly blessed by being a part of this family! Join us for worship at 4.20 p.m. every Sunday. 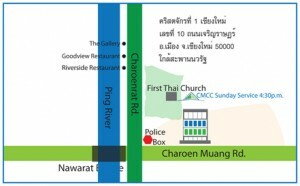 We meet at First Thai Church on Charoenrat Road, near the Nawarat Bridge. Our service usually ends at 6 p.m. Click on the map below to see an enlarged image. The map contains the address in Thai for you to show your driver if needed.